A week ago, putting together my Throwback Thursday tribute to the late Merle Haggard, I came across one of his finest early hit, "I Take a Lot of Pride in What I Am." Now Hag wasn't really a hobo. But he was born in a boxcar in Oildale, Calif., which served as his family home. And, of course, some of his best songs were those from the perspective of the downtrodden. 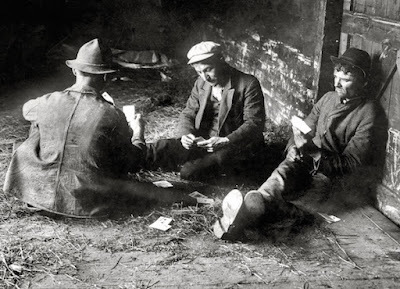 If anyone could sing about hoboes, it was Haggard. But he definitely wasn't the first to sing about them. Songs about the rail-riders spread across this great land throughout the early part of the 20th Century. Hoboes popped up in blues songs and hillbilly records. Some of these tunes were full of pity for the wayward and impoverished lives of these men. Some were cautionary tales, warning others to stay away from that life. Perhaps the first hobo hit was "Hallelujah. I'm a Bum," in which a tramp with attitude has witty comebacks for proper people who question the way he lives. There were several recordings of it around 1928 including versions by Hobo Jack Turner, Vernon Dalhart, John Bennett, Arthur Fields and Harry McClintock, who is best known for his song "Big Rock Candy Mountain," another important contribution to the Hobo Hit Parade. 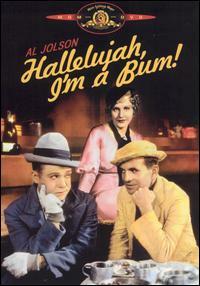 Later, Al Jolson starred in a movie called Hallelujah. I'm a Bum. Carl Sandburg in The American Songbag, wrote "This old song heard at the water tanks of railroads in Kansas in 1897 and from harvest hands who worked in the wheat fields of Pawnee County, was picked up later by the [International Workers of the World] who made verses of their own for it, and gave it a wide fame." McClintock, a member of the I.W.W., claimed he wrote "Hallelujah. I'm a Bum" years before he recorded it. I can't say if that's true, but he's the only one I know who's claimed authorship.